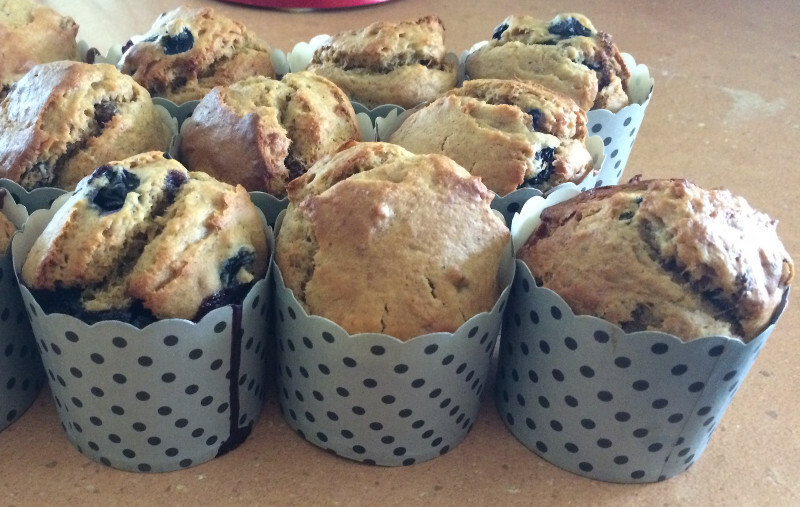 Preheat oven to 180 degrees and line muffin tins with paper wrappers. Place peeled bananas into a mixer bowl and beat until smooth with no lumps. Continue beating while adding in one egg at a time. Add in brown sugar and sunflower oil and beat until combined. Add in flour, baking powder, bi carb, salt, cinnamon and nutmeg and mix until just combined. Add in raisins and blueberries and beat till just combined. Fill muffin paper to 2/3 full with mixture. Bake in oven till brown and top springs back – approximately 20 mins.